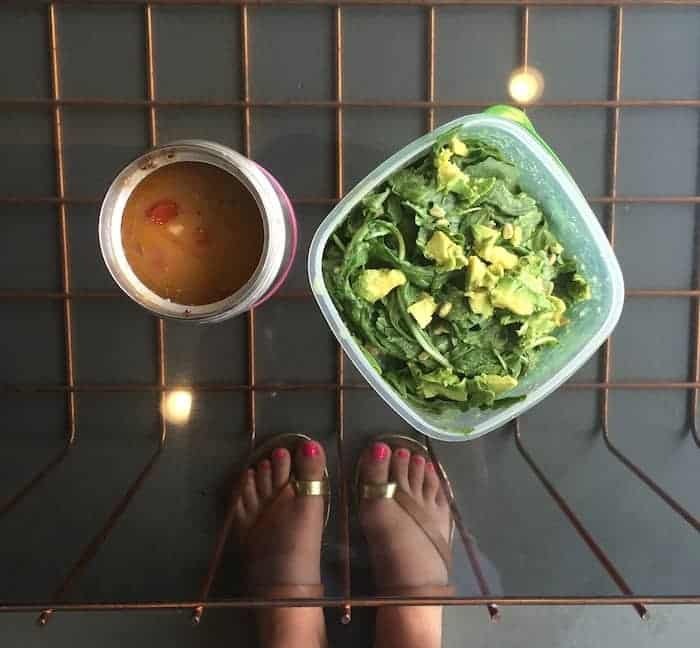 As I write this post, I’m simultaneously showering, making dinner, and editing pictures for Thursday’s post while I around like a chickpea with my head cut off preparing for tomorrow’s (or today’s?) Good Day Columbus segment. Do they make a device that can do all that at once? Let’s make one. If you live in Columbus, be sure to tune in at 9:45am to learn how to shake up your sandwich! Now let’s dive right in to the good eats. 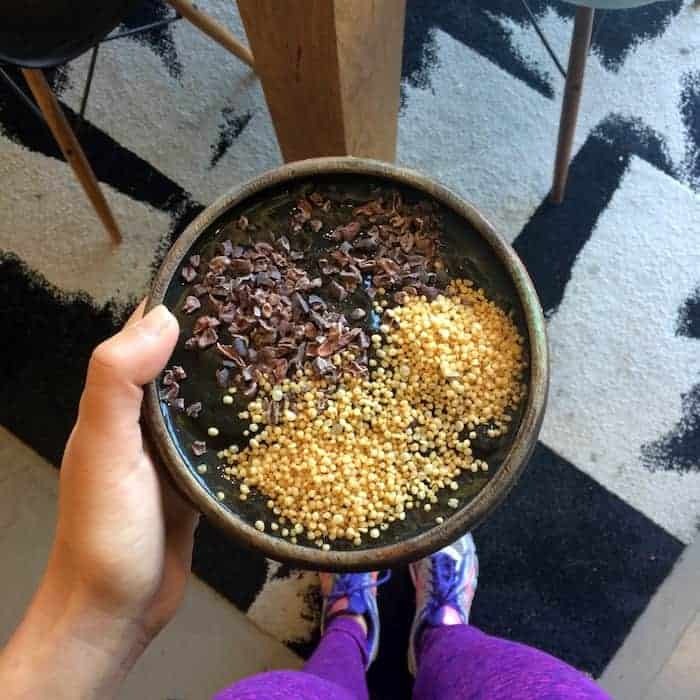 Breakfast was the usual blueberry cacao smoothie bowl topped with cacao nibs and puffed quinoa, shoved into my face in between the Alchemy breakfast rush that we all love so dearly. I also drank some coffee with soy milk because it’s nearly impossible to brew coffee and not want to consume the whole pot. That aroma though!! Why helloooo, long overdue pedicure! Lunch was my favorite Mango, Wheat Berry, and Arugula Salad with Creamy Cilantro Lime Vinaigrette. I doubled the arugula, forgot the mango, and used farro instead of wheat berries. It’s quite a forgiving recipe, pals. I also had a couple bowls of Alchemy’s super tasty tomato, chickpea, and quinoa soup of the day. …and a banana zucchini oatmeal cup. Keep you eyes peeled for the recipe tomorrow! Post-Body Pump dinner was a new tempeh and kale enchilada casserole recipe that I accidentally whipped up. I basically threw everything in my fridge in a baking dish and called it a casserole. Somehow it worked. Reeeeeeally worked. Then I had a bunch of unpictured multi-grain pretzels from tomorrow’s segment dipped in guacamole. I love guacamole like no other. I couldn’t end the night without a Chocolate Hummus Cookie Sandwich plus a couple spoonfuls of the extra hummus. It’s a dream. I’m pretty sure that roasted brussels sprouts are the best thing ever. I couldn’t stand them until I roasted them, now i can’t get enough! The casserole looks delicious! I would love a recipe for a healthy, vegan casserole. I just started school again and need good, quick recipes! You’re probably busier than anyone I know and still manage to eat and create the most crazy-delicious looking food…. you are a serious hero of a chickpea and we’re so lucky to get a sneak peek of your ways! Looking forward to the oatmeal cup recipe and hope the segment goes so so well. Question – where do you get puffed quinoa? Hope the segment goes great this morning!!! 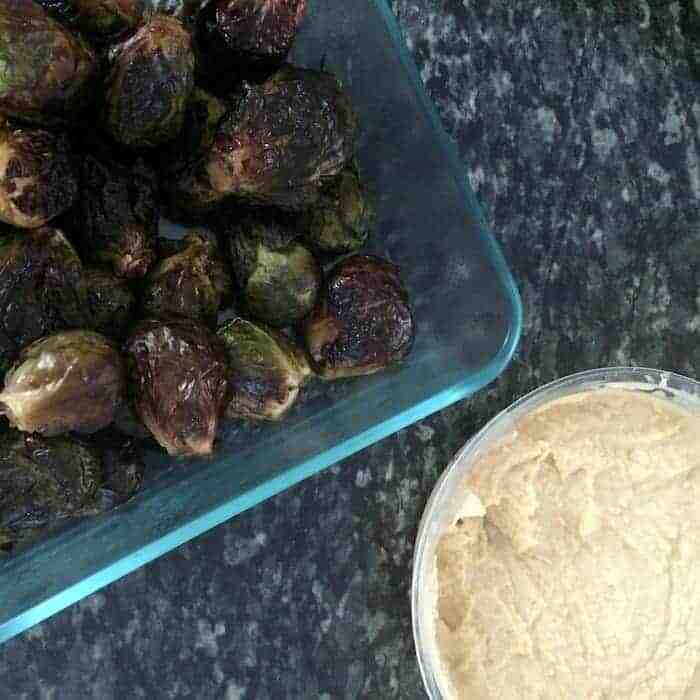 Must try roasted brussls with hummus! Cant wait for the recipe tomorrow! Chocolate hummus cookie sandwich got me like whaaaaaa? Sounds like a pretty awesome way to end the day! Brussel sprouts and veggies are great… but this excites me to a greater level ;). I love your blog! I’ve been reading for a few years now but JUST tried hummus and hot sauce (I use siracha) and i’m obsessed!! Its life-changing!! Now I have with my hummus on the reg. Thank you! Awww thanks, Eliza! Isn’t it so life-changing? !